Five very simple words can change the course of American civilization: Stay right except to pass. Given prices at the pump, there's understandably a lot of gassing about gas lately. Well, here's a simple solution: use the power and might of government to slaughter left lane hogs. Traffic everywhere will flow faster, fuel efficiency will go up, gas prices will go down and bada bing! We'll have taken a bold step to a better, safer and cleaner 21st century. Let's roll. Besides, according to a six-year study by the Institute for Neuro-Cognitive Traffic Research, the dominant cause of repeat road rage in males between the ages of 23 and 59 in all ethnic and economic cohorts is left lane blockage. Nearly 80 percent of all violent road incidents initiated by males were preceded by at least one incident of left lane blockage frustration syndrome in the prior 72 hours. Actually, I made that all up. But I really, really think it's probably sort of true. You know what Left Lane Losers (LLLs) do; they plop themselves in the far left lane and then barely keep pace with the traffic flow, oblivious to anything in their rear view mirrors. Their physical posture often conveys sanctimony, a self-satisfied visual declaration that, "I'm going at the exact speed limit so I deserve to be in the left lane even if other delinquent and sinful motorists care to drive at unsafe speeds." Sometimes LLLs are just space cadets — cell phone yakkers, Sunday drivers or in-car singers. They are always dangerous. They inspire tailgating, right lane passing and other treacherous tactics. These are the people who sit in front of you in empty movie theaters. Left lane hogs don't exist in Europe, where driving is considered a skill, not a fundamental human right. In Europe, if you're in the passing lane but not passing, someone will drive right up your kazoo with flashing high beams and you are expected to get in the right lane immediately. In fact, you are expected not to be in the passing lane at all and you feel guilty and unskilled for having messed up. That is exactly as it should be. God invented the rear view mirror for a reason. But in America, it appears that we have to depend on laws and rules instead of skill and courtesy. 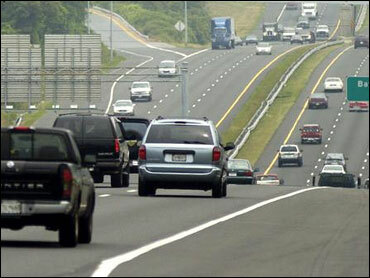 So last summer, Colorado passed a law cracking down on left lane squatters. From July through the end of the year, state highway patrols just gave out warnings. Since January, they've been handing out about five tickets a day at $41 and three points a pop. Florida legislators are pondering a similar measure, with a $60 fine and four driver demerit points. A few other states have sensible "keep right" laws. But most states simply follow the Uniform Vehicle Code that requires slower drivers to keep right, a namby-pamby pseudo-law that is never enforced. We need enforcement. I'm thinking of a federal law with a special appropriation to add thousands of highway patrols — Operation Left Lane Freedom. Don Rumsfeld should run it. And I think pictures and addresses of LLLs should be published online, just like child molesters. But, hey, that's just me. This week, the Bush administration proposed some inane rules to increase required SUV gas mileage by something like half a gallon over the next seven decades. Forget it. Here's the solution. First, liberate the left lane. Second, ban SUV's completely; they're gas-guzzlers, visibility blockers and the second leading cause of road rage. Third, immediately eliminate all tolls; they're a medieval and inefficient form of municipal revenue collection that should have gone out with the invention of asphalt. Meanwhile, just stay to the right, please.